No new art today, but still stuff to keep me busy throughout the day. In the morning I drove to Belmar to check out the unveiling of this summer's youth art project- the city on the moon. From there I drove up to the Studio, where Molly's weekly etching class was just finishing up. Her students were very excited by the progress on their current projects. I was there for two reasons. First, I had to pick up a couple of things to help me with framing the arcade print for tomorrow's show. Second, we've been wanting to get a timer to keep our critique night from running too long. (depending on how many people show up, we usually set a limit of 10 to 15 minutes per person) Molly had said that there was a place there in Ocean Grove that had some in fun shapes. Took me a while to find the store, but eventually I did and bought one in the shape of a little toaster. Left the toaster in the Studio, brought my other stuff home. Later in the evening I framed a copy of the arcade print, using the frame I had used for the tattoo print in June. It's ready to go for tomorrow. As expected, it didn't take long to finish the second okawara copy of the arcade print. 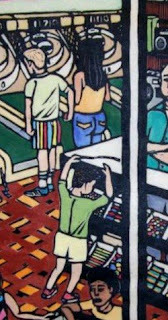 Indigo, a few values of gray, purple (pinball machine artwork) and a little bit of burnt umber (mostly for various shades of brown hair on some of the patrons). I hung the new one under the old one. They are not exact copies in the strictest sense of an edition, but you'd have to go over them inch by inch to find the discrepancies between the two. I took the new one home, to be framed tomorrow for Saturday's drop off. You can't hear it, but the music playing on my little portable stereo (purchased in 1992 and still mostly functioning) was a disc of favorite songs from the Wipers, 1978 to 1988. Having spent something like 12 of the past 13 days working in one way or another on the arcade print, and seeing that I'll have the coloring of the 3rd copy wrapped up soon, I took a day off from the watercolors today and spent a few hours with pencil and charcoal at the figure drawing group in Belmar. Used pencil for the short poses (planned as 2 to 10 minutes, but they tended to run a bit longer) and charcoal for the longer ones. 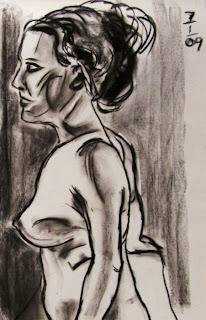 The image above is a 20 minute charcoal drawing, my best one of the night. Had a very efficient coloring session in the Studio today. Started with greens- dark, light, and the pale wash that is on the back walls and some pieces of clothing. Then the turquiose color and on to the blues- sky blue, phthalo (mostly as a wash), and ultramarine. Not much left to do, just indigo, assorted grays, and various little bits and pieces around the composition. Shouldn't take long at all. Put in a few more hours on the 3rd proof today. Only completed 4 colors this time, but covered more of the page than I did with 8 colors yesterday. The deep red (floor, shelves, and a few details) alone accounted for half my time working today. Also did the bright red, pink, and burnt sienna. What's left took me three sessions to finish last time, but with the colors all mixed and the combinations worked out, I think I can cut that down to two, keeping me on track for my deadline. 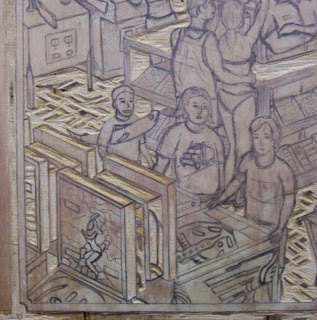 Time to color the 3rd proof of the arcade print. Third time around should be easier- all the colors are determined and pre-mixed. Today I got through all the pale yellow, light and medium tan, naples yellow, cadmium yellow, skin tones, and orange. This still leaves me with about 12 colors to go, but they should go quickly. Didn't bother bringing the camera with me today, but if you really want to get a sense of what it looks like now, it's somewhere between here and here. Today's plan was to finish coloring the first okawara proof, the first in the edition. There wasn't that much left to do beyond finally making some decisions. First on my list today was to finish the video game in the background of the right side. The game is an Asteroids machine, hugely popular back in the day. The screen graphics were very primitive by today's standards- the asteroids were irregular polygons of specific shapes, white lines on the black screen. I could have cut something like that, but that combined with the mostly black cabinet would have be too much solid black. So I made the decision to cut out the whole screen and deal with the problem later. At the last Studio critique group Molly had suggested collaging something in there, like a clipping from a magzine or something. (Molly has never met a piece of paper she wasn't willing to collage into one of her own artworks) I've done collage before on occasion, but I wanted to keep these prints consistent and somewhat traditional. Still, this called for something a little different. I first colored the whole screen indigo, sort of a colorful dark gray. Okay, but dull. This kind of paper wouldn't permit me to hand paint the thin lines, though it would let me print thin lines. My solution was to cut a little rubber stamp out of an eraser in the distinctive asteroid shape, hand paint it with white watercolor paint, and stamp on the screen. Reapply and stamp two more times and it's done. It breaks up the indigo space nicely and the identical shapes are another example of pattern in the image. Another decision was clothing- a few pieces remained to be colored. 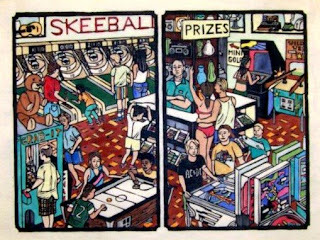 The second photo shows the decisions I made- naples yellow on the skeeball player's shirt, and the light green I'd used elsewhere for the kid by the prize counter. The last major decision was the side panel of the pinball machine. I used some scrap paper to pull some light ghost prints of the pinball cabinet with the little bit of ink residue left on the block. Cut these out and colored them to make some quick mock ups of my options. Straight substitution of a cool color for the red, not so good. Switching the white and red, not bad, but still a little confusing. Then I thought to combine the two. 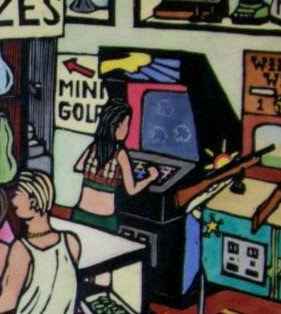 Not accurate to this particular machine, but typical of the bold geometric graphics on period pinball machines. Third photo shows the results. A few other touch-ups after that, and then I was done. I'll look it over in a few days, but I'm pretty sure that this is the final version. As expected, it's fairly similar to the first color proof, but there are some differences. Several figures had colors and/or patterns of clothes changed. Except for a few spots on the pinball machine in the lower right corner, I eliminated all the purple throughout the composition. It just didn't go with the other colors, and what I substituted (all colors already used elsewhere in the print) was always at least as good if not better. I varied the colors in the wall niches holding prizes, to give them more depth. All these changes can be seen in the last photo. I'll color the other proof to match and be ready to start the next one early next month. Today's mission was to fill in all the blues. That I did- on clothing, game machines, prizes. I also decided to change the dark green, mixing one that was a little lighter and warmer and overlaying it wherever the previous green was. I think it's a little better. Also put in the grays, usually representing metal parts on machines. Some pink and purple went down as well, mostly on a pinball machine. 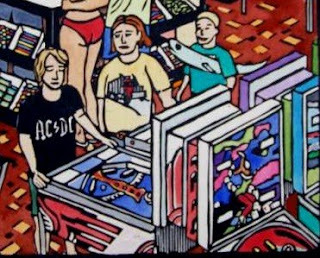 Still have a few decisions to make- that side of the pinball machine I wrote about yesterday, a few pieces of clothing and prizes. After that, see if any color adjustments need to be made, then call it done. When I got back to the current proof today, I continued with putting in some reds- the neon sign, here and there on machines. One place I held off was on the machine being played by the guy in the black shirt. 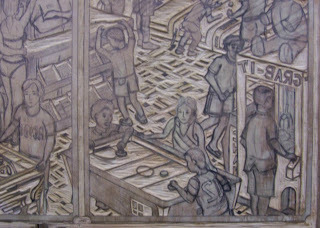 The top photo shows a detail from the first proof. 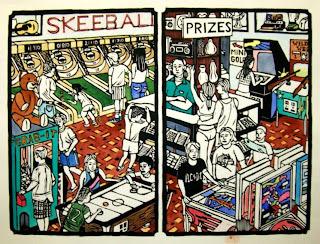 The two pinball machines in the foreground are simplified versions of two very popular games from the period depicted in the image. (however obscure one's interests are, there's a very good chance someone else has already posted it somewhere on the internet) The designs are simplified, but the colors are meant to be accurate to those particular games. The problem is that the red color on the side of the machine on the left is similar to the adjacent red carpet, making it all kind of run together. I'm considering two options- either switch the locations of the red and white, or substitute another color (something in the blue to green range) for the red. Having put off that decision, I moved on to greens. 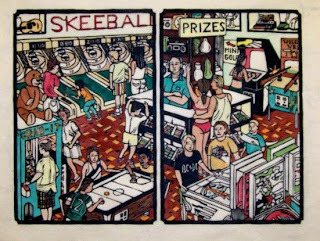 Mixed up a new dark green to put on the skeeball lanes and an air hockey player's shirt. A little darker and more blue than the version on the first proof. Don't know if I like it yet, and won't until I see all the other colors around it. Used a lighter yellow green on machines, prizes, etc, and pale washes of the the two greens on the back walls and some shirts respectively. Next was the light turquoise, pretty much in all the places it was in the first proof. Decided to call it a day after that, progress shown in the second photo above. What's left is mostly blues and grays, a few details, and decisions yet to be made. Spent about 4 hours today in the Studio, with the results above. Today I put in skin and hair color on all the figures, then moved on to put in all the orange and browns around the composition, then all the deep red on the floor, shelves, and other spots. I put in some of the bright reds before I decided to pack up for the day. Next up will be to finish all the reds, then move on to the greens and maybe the blues. I started off today by pulling another copy of the arcade print on okawara. Hung that up to dry for a few days. Cleaned up all my ink and put out my watercolors. The first proof on the Japanese paper will be based on what I learned on my practice copy. It will go a little faster than the first, despite having to work more carefully on this thin paper, since I pretty much know where all the colors will go. In typical fashion, I started with off white, yellows, and light tans. So far so good. I'll start adding some more exciting colors tomorrow. Back in the Studio this afternoon for a while to finish out this first draft color proof. 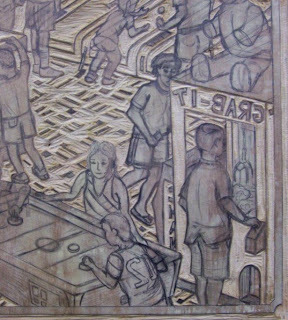 Today's work involved filling in the last few pieces of the figures, coloring more of the prizes, pieces of pinball machines and other details. Then I spent a while looking at the results, after which I made a few minor changes. I brought it home with me to spend more time with it. Most of what I did here will stay more or less the same in the next copy, just maybe slightly muted as has happened with painting on the okawara. I see a few things that I definitely plan to change, and there are a few other things I am considering. I'll work it out as I go. Most of today's coloring was devoted to the figures. All got some basic skin tones and most got their clothing colored in. Also added more details to some of the machines. I decided to try changing the color of the back wall in the right panel, adding a light wash of green. I liked it and did it on the other side as well. It sits back just as well as the blue wash did, but I think it works better in the overall color palette. The more color is filled in, the better I like it. Some of the key colors are more balanced now, even as the distribution of color feels more and more chaotic. I think this will contribute to the arcade feel. 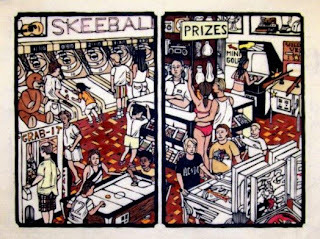 When I showed the very early progress at the Thursday critique group, one of the artists recalled Belmar Playland as a noisy place, between the kids and all the machines, and felt some of that in the print. Color is one way to create noise on the paper. Got in a few more hours of coloring today. Even though I had said I was going to leave the green on the skeeball lanes alone for a while, I was using a dark green on a shirt and decided to try it out on the lanes. Don't know if this is the exact shade, but it's better. I'm thinking maybe a green tinged back wall might work better than the light blue wash there right now. 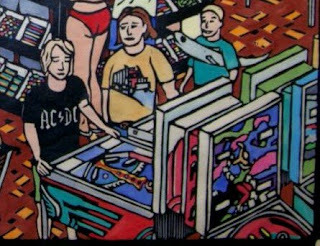 I put in a few other isolated pieces of colored clothing, but the most noticeable changes were in the area of the pinball machines. Did a little more work on the machines in the background on the right. Next time I need to finish a lot of the people, see where that takes the image. 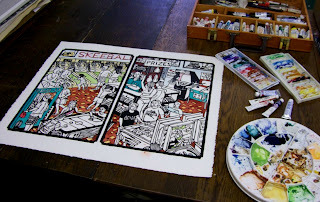 Spent a short session in the Studio this afternoon, starting the coloring of the arcade print. I considered a few options before going with the red/orange pattern for the carpet. The red is also found on the shelves behind the counter. 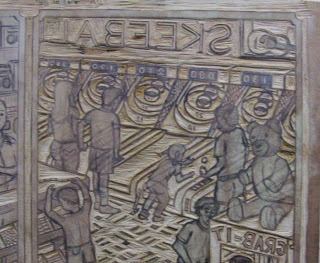 The turquoise color went on the attendant's shirt, just as I used it for the worker in the wheel game print. Put the same color in two other big pieces for now. 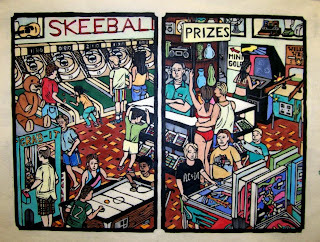 For the skeeball lanes I went with colors based on my research. Not crazy about the green there (too light/bright I think) but I'll leave it for now and see how things develop around it. Another thing I'm not satisfied with right now is the light blue wash I put on the back walls- sort of a cool off white. Might need to make that color a little deeper eventually. I'll continue with the stuff I know, then fill in the undetermined stuff (figures mostly) after I see how things have worked out. 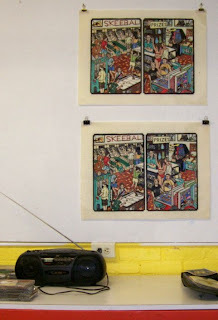 I brought the print home with me, then back out that night to the Boatworks for the BAC critique night. It's also the night for the monthly coordinator meeting, which I sat in on first. 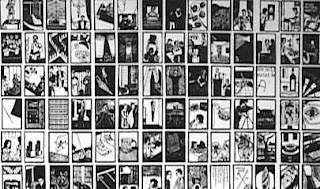 As a result, someone familiar with the print and the series explained most of the basics to a new participant before I was able to join them. They liked what they saw so far and look forward to seeing the finished piece in next month's show, if I get it done in time. While my recent print continues to dry I have been spending time on other art related stuff. The past few days especially I was working on my application for the latest round of Mid Atlantic Arts Foundation grants. Never had any luck with this in the past, but hey, someone has to get the money, and the work I submitted this time around is as strong as any I've done. Got the online application finished yesterday, and the mail in portion went out this afternoon. I'll post the results here in about 6 months. 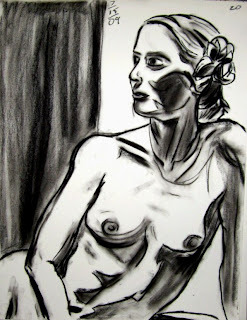 With all that settled, I could enjoy an evening of figure drawing in Belmar. It was a pretty good session, a couple of decent drawings, the best of which is above. Nights like this take me back to the summer after I graduated college the first time, when I ended up taking a summer life drawing class at Montclair State. Three nights a week, four hours per night, for eight weeks for six credits. Helped me get to the next level with my charcoal drawing. One of my classmates from that course (and a few others that I'd later take at Montclair) would sometimes look back on the experience as "drawing on those sultry summer nights." The weather this summer has been relatively mild so far, but at the end of the night when I leave the air conditioned building and walk into the still warm July air, there's a little of that feeling. Finally it's time to print the arcade block. I got some paper ready, then began inking the block. Pulled the first proof on a heavy printmaking/watercolor paper, since I need something that can stand up to multiple washes as I work out the colors. I made a few very minor adjustments to the block after looking over the first proof. 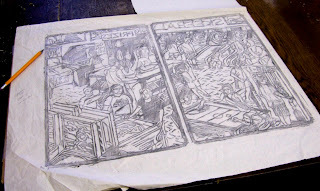 The second proof was on Okawara, like the editioned prints of the first two boardwalk prints. The above image is the 2nd proof. I think it turned out all right. I'll let it dry for a few days, and start the coloring process later in the week. 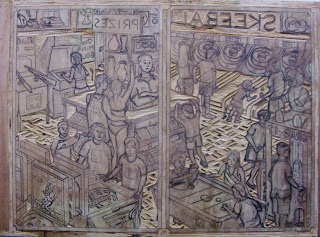 I started today by finishing the last few figures on the left panel. After that I cut the various objects on the shelves behind the counter. 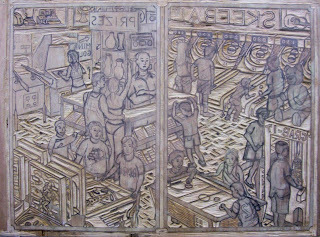 At that point I took a pencil rubbing on newsprint of the whole diptych to get a sense of the value balance- in each panel and across the whole composition. In general I liked it, but as I expected, some of it was a little heavy. For those shelves I decided to leave the front vertical and horizontal edges solid black (should set up a nice rhythm with similar black lines throughout the print) and cut stripes in the shelf backs (like I did with the wheel game shelves) to lighten them up. One piece that I hadn't quite decided on yet was the Asteroids game in the back. That primitive video game had a black screen with the space ship and asteroids made of thin white lines. Easy enough to carve, but with the mostly black cabinet around it, that would be a big hunk of black in the composition- too much. So I cut it out completely, and I'll figure the color later. 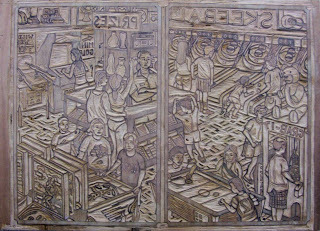 In addition, doing the rubbing has the effect of revealing various spots that had been missed- a little piece of shoe, a small strip of skee ball machine, etc. Took care of those. I'll give it one more look over tomorrow, but at this point I think the cutting is done. Next time I print. Back to the Studio again today for a little while. My goal was to finish cutting out all the figures on the left side and maybe get to some of the prizes on the shelves, but I had to cut short the session to get down to Belmar in time to check out the latest art reception at the Boatworks. Even so, I finished most of the figures. I should get it all done tomorrow, and maybe make a decision regarding the shelves. I still haven't resolved the dispute between my digital camera and my computer, but with a grant application deadline looming, I decided to go around it. My brother has a camera of the same make, thus the same downloading/editing software, so I drove up to his house in the early afternoon to get a month's worth of photos out of my camera. This includes images of the current block in progress, which I have gone back and posted on the appropriate days (if you want to see them, look at postings from June 12th to June 25th). A borrowed camera has gotten me through everything since then. Friday afternoon southbound mid July traffic on the Parkway being what it is, I took a more roundabout route back to my Studio. 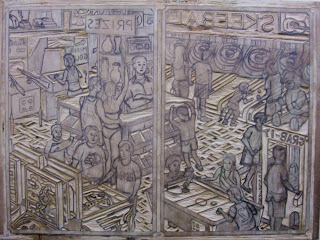 A shorter session than the last few, but enough to cut the other 6 figures in the right side panel. That should finish all the cutting on that side. Over the weekend I'll give it the once over (or maybe the once over twice, to borrow a line from Exene) to make sure I didn't miss anything, and confirm it with a rubbing that I'll do after I finish cutting all the figures in the other panel. Cutting of the arcade block continued today. I cut a couple of signs in the background, and (after I drew in the cabinet graphics) the shooting gallery game. Today was also the day I started cutting out the figures. I finished 6 of the 18 in the image- 5 on the right side, and 1 on the left. 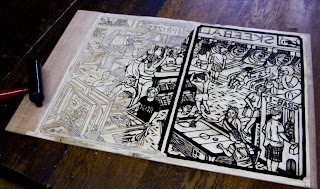 At the current rate I should be done cutting the whole block over the weekend, and be ready to print early next week. 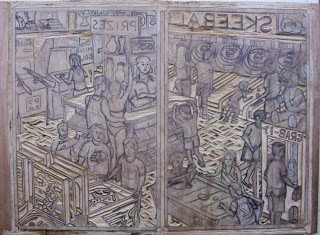 Another big chunk of this block was completed today when I finished the whole skeeball section (as seen in top photo). Also completed today were the claw machine, the air hockey table, and the prizes in the display cases (under the counter and on the wall). 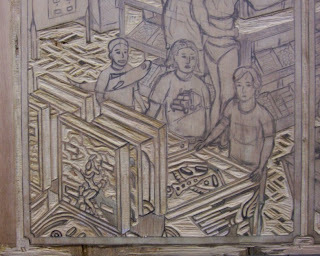 In fact, the whole right panel is now cut, except for the eleven figures- including the large teddy bear as one of the figures. Still have to make some big decisions on the left side- the shooting game and the prize shelves. The former just needs a little more research, but the latter may wait until after I cut all the figures (both panels) and look at the value balance after all that. Put in a few more hours cutting. The biggest single thing done was the top of the air hockey table (see top photo), but I was working all around the block. Did some cutting of the video game and shooting gallery game in the back, some of the prize windows in the back walls (guitar and fan), and more on the claw machine and prize counter. Still have a few decisions to make, but it's starting to come together. First Monday of the month means another critique night. 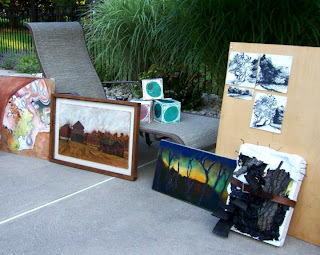 However, rather than having it in the Studio, this time it was hosted by one of the regulars at her home, on the patio by her pool. 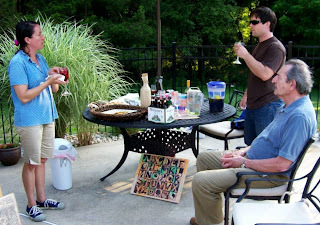 We had 7 of our regulars in attendance tonight, all with art. I brought the current boardwalk block. It got a good response from the crowd. 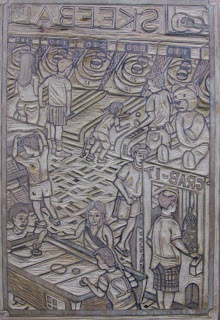 People liked the level of detail, citing such things as the pattern on the floor, the rifles on the shooting gallery machine, the truck design on someone's t-shirt, the appliances on display as prizes, and the giant stuffed anchovy (borrowed from the wheel game print) carried by one of the kids. 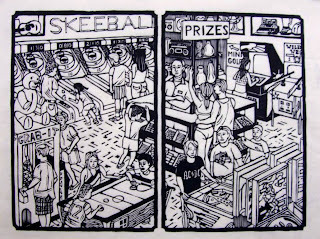 A few figures were viewed as slightly problematic, such as a question of whether the man behind the prize counter was too dominant (and noticeably not having fun), and some minor anatomical suggestions. 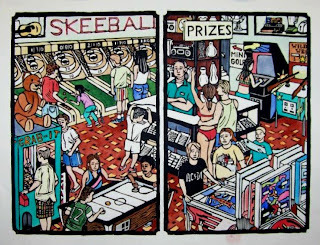 The idea of having fun was discussed a bit- I had brought up my experiences in contemporary arcades, and found I was not the only one who has had that reaction. We went over our 10 minute limit on everyone's art, but we had started a little earlier than usual, and the discussions were good, so no one minded. In the afternoon I went up to the West Long Branch Public Library to attend the opening reception of an art show by BAC and discussion group member Guido Guazzoni. Then down Monmouth Avenue toward Asbury, and on to the Studio. Today's mission was to finish cutting out all the pinball machines. 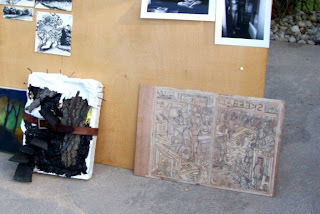 Top photo shows the results. Glad to have all this detailed cutting completed. Bottom photo shows the progress of the whole block. 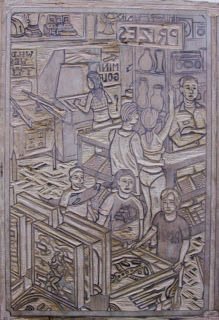 Today is the 15th anniversary of the completion of my 366 print woodcut series The Fourth of July. 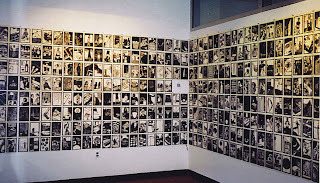 My largest single body of work, and still one of my most talked about. 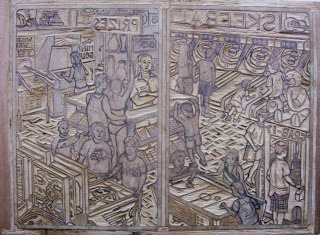 Producing this piece in grad school was very important in my development as a woodcut artist, with some individual pieces influencing later works. To learn more about the story behind the series, and to see all the individual images (with explanations of each print) go check out my Fourth of July blog. Today's cutting concentrated in two areas. I started in the corner by the pinball machines, and cut tops and sides of the back panels. I'll cut the spaces in between next time. Then I moved to the other lower corner and started cutting the claw machine. The other thing I did today was put some graphics on a few of the shirts, themes common to that era. I'll add a couple more before I start cutting out the figures. Came home from the Studio, stopped just long enough to find some charcoal, then drove up to Belmar to sit in on the bi-weekly figure drawing classes that are held at the Boatworks. In the past I've gone now and then around my busy schedule. Now that it's summer, and the critique group that was sometimes a conflict has been moved to Mondays, I may go a little more often. The resulting drawings (such as the 15 minute charcoal sketch above) don't have anything to do specifically with any current print project, but it's generally good practice for drawing all the figures that will be populating my boardwalk scenes. Back to the Studio for a few hours today. As expected, I started with the prize counter. I cut the countertop and a few pieces seen though the glass, but I decided to hold off on the rest until I make some decisions about value patterns through the whole print. 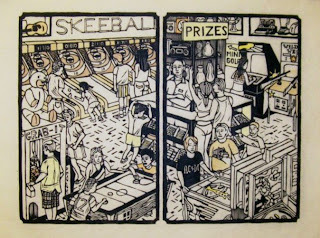 So I moved on to the skeeball lanes, cutting all that out. The last thing I did today was cut out a few pieces of floor missed yesterday- a couple of spots among the pinball machines, and some seen though the glass windows of the claw machine.